A recent addition to the Ethiopian diet, the potato—unlike cereals—has a short crop cycle, and, therefore, could substantially improve the incomes and livelihoods of producers, traders and other actors in the potato value chain. However, the value chain is generally underdeveloped. While boiled potatoes are commonly consumed in traditional dishes, such as ‘wot’ (sliced, boiled and spiced potato) and ‘beyaynet’ (potato and accompaniment), awareness of other consumption forms is low except in cities where food markets are in flux, stimulated by increasing urbanization and tourism. 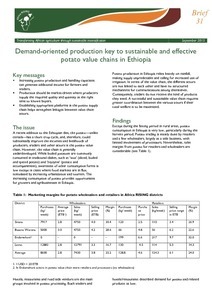 The increasing consumption of potato provides opportunities for growers and agribusinesses in Ethiopia. Increasing potato production and handling capacities can generate additional income for farmers and traders. Production should be market-driven where producers supply the required quality and quantity at the right time to known buyers. Establishing appropriate platforms in the potato supply chain helps strengthen linkages between value chain actors.